Served from tap in a 16 oz (473 ml) conical pint glass at Sea Dog Brewery in Topsham, Maine. A: Pours a crystal clear, golden with a slightly rose hue, a less than quarter inch head, low retention, no appreciable lacing. S: Aromas of peach, pink grapefruit, and honey. T: Semisweet with peach flavor predominant up front. Citrus and cherry/cranberry notes maybe appreciable. Little bitterness. M: Light bodied with only very light carbonation. O: This is classified as a American Pale Wheat Ale, but I really did not appreciate too many elements of that style. This would appear to be a Fruit Beer with the peach flavor so strong, it basically tastes like a peach soda. How that flavor was arrived at it is of interest. Draught @ Brew City: This one pours a clear golden color. There is a small white head and no lacing. Lighter aroma. Some malts and grapefruit. Somewhat lighter body. Tastes include wheat and some sweet grapefruit, but not from hops. Refreshing. Pours a yellow amber color with white head and moderate carbonation evident. Nose is a bit Muted, taste has more citrus, oranges, and grapefruit juice. Medium body and moderate carbonation. An ok beer; decent for the summer in lieu of a shandy. Pours a clear deep copper color with a finger of white head that recedes very quickly, leaving little in the way of lacing. The aroma is extremely fruit-forward, bringing notes of peaches, lemon, and orange with a back end of freshly baked bread. The flavor brings a ton of peach notes, as well as some candied orange, honey, and pineapple. Finishes lightly bready. Very sweet, but not cloying. The feel is light bodied with fairly hefty carbonation. Crisp and dry on the finish. Overall, a pretty good beer for what it is. It's very sweet and fruit-forward, but doesn't ever feel cloying. Definitely refreshing and drinkable. 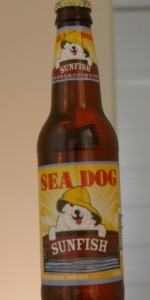 Sea Dog Brewing Co. "Sunfish"
Notes via stream of consciousness: Sunfish? I wonder what that refers to. And the label reads "ale with natural peach & grapefruit flavors added"... I can't help but feel this is Sea Dog's jump onto the tropical fruit bandwagon. Let's see... clear deep golden, almost orange, beneath a short head of white. Unfortunately the head retention and lacing seem to be limited right off the bat. Oh well. It smell like peach, that's good. Peach gummie candies. Just a little bit of grapefruit in there. It's nice, a bit candyish, but pleasant and welcoming. As long as the flavor isn't the same we're OK... uuhhhhh, but we're not, it's actually very much like the aroma. There's a malt component to it as well, but the peach comes on pretty strong, and it's not very authentic tasting, it retains that sugary candy character. Again, the grapefruit is at the back. It's not nearly as sweet as the aroma suggests though, so at least there's that, and in fact I think it's fairly well balanced. Light-medium in body, or medium-light, however you want to take it, somewhere right in between. Moderately carbed. Delicately tingling. The grapefruit mainly shows in the finish with a light touch of acidity that helps to balance it. Eh, overall it's not a bad beer for the hot summer weather but there are other beers that have done the peach better; I won't rate it against those though, I'll let it stand on its own. Nice light warm weather beer. Peach and citrus aroma and taste.